Humankind’s ability to domesticate other species, and to further modify the characteristics of these groups via artificial selection, is one the most important features of our species’ recent evolutionary history. Collectively, humans have domesticated hundreds of crops and animal livestock species. Among them, dogs are perhaps the most unique. The dog is the only large carnivore that has been fully domesticated and one the few domesticated animals that was not kept primarily for food. Despite their widespread adoption into human cultures today, relatively little is known about the early events in the history of dog domestication. When and where did dogs originally become domesticated? One way to address these question is to study fossilized dogs and dog ancestors. 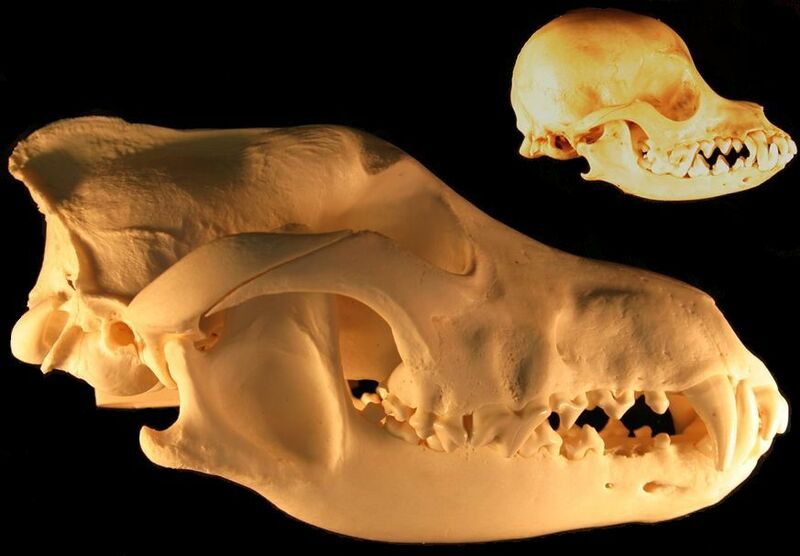 Dogs have recognizable anatomical differences from wolves (see Figure 1 for an extreme example) and, with enough transitional fossils, we could put dates to the major steps in the domestication. However, the fossil record is woefully incomplete, and the fossil evidence that does exist is difficult to interpret with certainty. For these reasons, Freedman et al. (2014) sought to investigate the early history of dog domestication using a population genetic approach. Using patterns of shared genetic ancestry is a powerful way to learn about the recent history of a population. Specifically, they compared the genetic patterns of relatedness and divergence using the complete genome sequences of three dogs (including two ancient breeds: basenji and dingo), and three wolves selected from geographically diverse populations (China, Israel, and Croatia). First, the authors measured the number of heterozygous mutations (sites in the genome where the two copies of the chromosome are different) in each individual. An individual’s heterozygosity is an indicator of the size of the population they came from, because smaller populations will lead to mating between more closely related individuals, which means less mixing of different mutations (i.e., lower heterozygosity). They then used the distributions of heterozygous mutations, which indicate how closely related the maternally and paternally related chromosomes are, to infer the population size of each lineage in the recent past. We expect the population sizes to shrink during domestication and artificial selection, because only the “selected” individuals are breeding. As expected, dog lineages show a dramatic decline in population sizes in recent years. They also found, surprisingly, wolf populations have also declined substantially over the past 100,000 years. In their second set of analyses, Freedman et al. 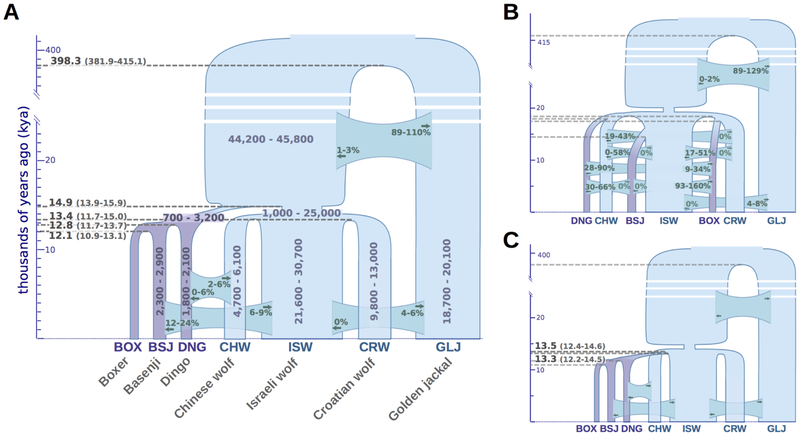 searched their data for evidence of recent gene flow between their focal populations, and they found evidence consistent with substantial gene flow between wolf and dog lineages that co-occur in similar geographic areas (e.g. between Chinese wolf and Dingo). Collectively these initial results indicated that dog domestication has an unusually complex history. Figure 3. Three models evaluated by Freedman et al. (2014). In these models, the width of vertical segments indicates the population size at that point in time (y-axis is time going backward into the past starting from the present). The width of the horizontal line segments indicates the timing of gene flow between diverging populations, and the proportion of gene flow is indicated on these line segments. In the first model, which best fit the data, dogs and wolves diverged from a large ancestral population, and then each group’s population size is strongly reduced. After population sizes recover again, there is a varying amount of gene flow between the now divergent populations. Following this, Freedman et al. proposed three models for the history dog domestication (Figure 3). 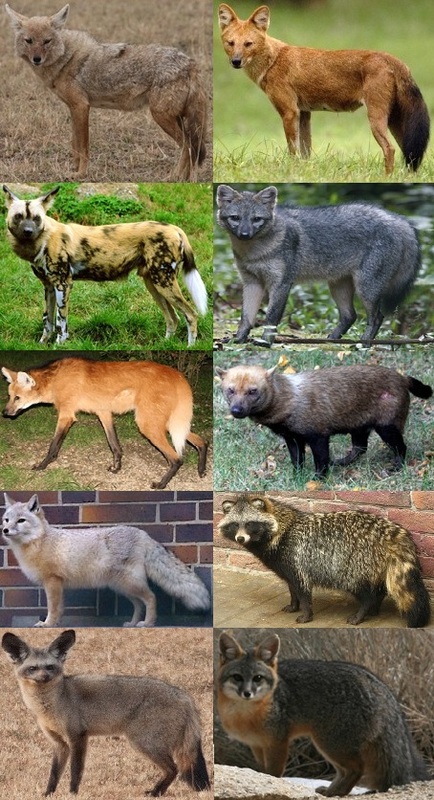 They then compared the likeliness of each model by comparing the observed genetic variation with the genetic variation that is expected given each proposed model of dog domestication. The researchers found that a model of a single dog origin, and subsequent gene flow between geographically nearby dog and wolf populations was the most consistent with their data. Importantly, the authors estimate that dogs were originally domesticated between 11-16 thousands years before the present, before the advent and widespread adoption of agriculture. Freedman et al.’s results mean that dogs would have instead become domesticated contemporarily with hunter-gather human populations. This figure puts dogs among the first, if not the first, species to be successfully domesticated by modern humans. In other words, if not his best friend, dog is certainly man’s oldest friend. Russ Corbett-Detig is a postdoctoral fellow in the Department of Integrative Biology at the University of California at Berkeley. What a great post! I just read it for the second time and sent the blog link to a whole group of interested students.